Scotch Brite is a known cleaning brand in the US. The brand has been around for quite a while hence everyone knows that their products are of high standards. 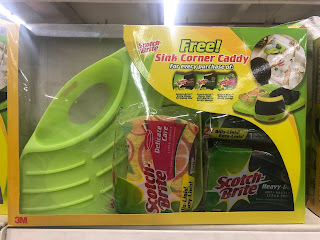 Recently, Scotch Brite is raving the marketing scene with their newest custom promotional giveaway -- custom sink corner caddy. What's a custom sink corner caddy? It's a kitchen innovation that is widely used in most households. This is usually made of stainless metal but Scotch Brite introduces a plastic kind as their gift with purchase. If you are still in doubt with the winning ability of this custom sink corner caddy, below are some of its highlights. Why is this custom sink corner caddy a winning promo item? Uniqueness - Yes, being an uncommon promo item, the corner caddy easily propels the brand to success. Everyday, we see and receive various promotional gifts like pens, T-shirts, caps, glass, etc. and these items are one of the most common gifts that brands give out. But, even if these are common, we still appreciate the brand. In Scotch Brite's case, this corner caddy is one of the rarest marketing giveaways that a brand has used. That being said, customers feel extra special because they know that they are receiving something special. This leaves a good impression on the brand. Overall, giving out a unique promotional item is really important because it impacts on how customers perceive the brand. If this item interests you, feel free to contact us anytime. Our team is an expert in marketing and manufacturing.